You don’t have to dig deep to know what the most popular thing to do in Guatape is: images from the top of El Penol have become Instagram famous in the last couple of years, and deservedly so. But as much fun as climbing 700+ steps up for an overview of the lake surrounding Guatape is, Guatape itself would be worth visiting even without its main attraction–and though Guatape is a popular day trip from Medellin, there are more than enough things to do in Guatape to make this colorful town worth spending a night (or even more) in. We were invited by Lake View Hostel and Colombia Getaway to spend two nights in town, and we left after our time in Guatape feeling like it would be very easy to let a peaceful, slow-going week pass by in Guatape. 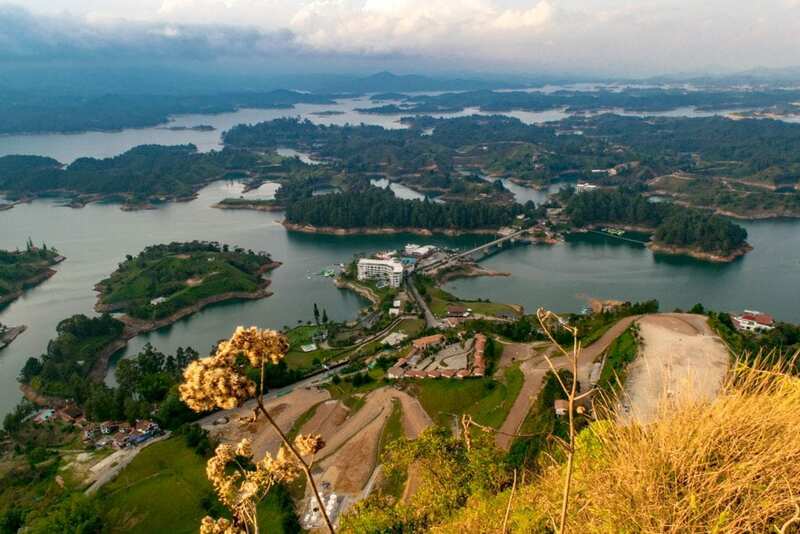 First things first: you can’t come to Guatape without taking in the views from the top of El Penol. True, the climb is 700+ steps, but the views are worth it. When you arrive at the top, feel free to stay awhile–you worked for it, after all! 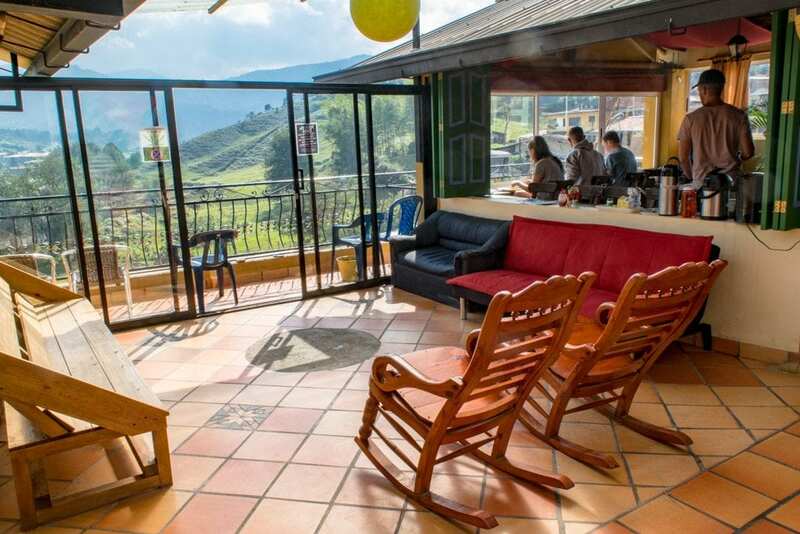 The top of El Penol is home to a small cafe selling snacks and drinks, as well as a couple of souvenir stands and plenty of places to sit down. 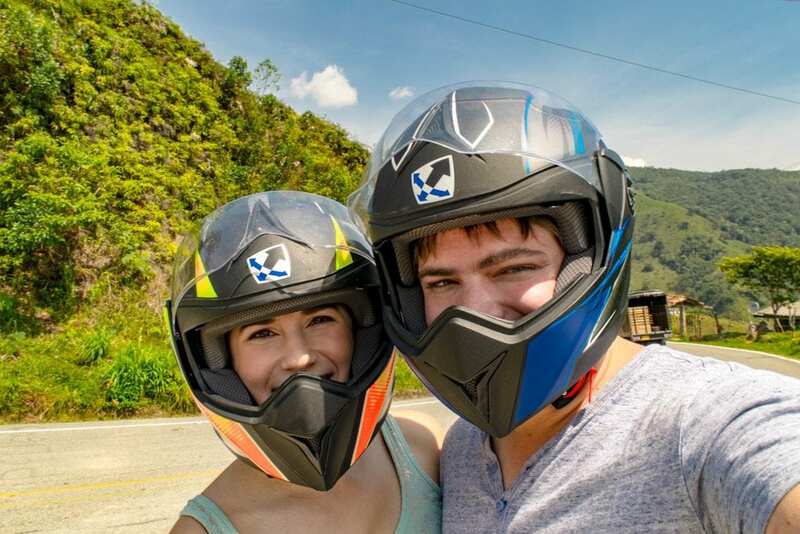 Guatape makes an excellent hub for adventure activities of all kinds: whether you want to rappel down a giant waterfall, give paragliding a try, try out an exhilarating hike, or bike down curving mountain roads, Guatape will leave you spoiled for choice. One thing we don’t recommend in Guatape? Ziplining. There’s a small zipline near the shore in Guatape, but quite frankly, it looked like one of the most boring (though inexpensive!) ziplines imaginable. Guatape is, hands down, the most colorful town we visited in Colombia, beating out even famously colorful Cartagena. 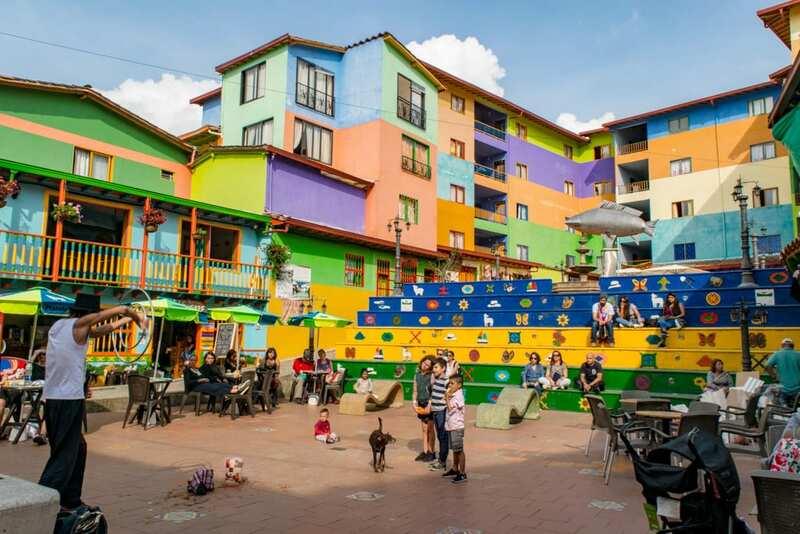 The buildings in the center of town are all brightly painted, and pretty zocalos (patterned designs that remind me a tiny bit of wainscoting with a very Colombian twist) cover the bottom halves of many of them. We passed hours of time wandering through town ducking into shops, watching street performers in the main square, sipping coffee from cafes, and of course, photographing everything in sight. Take to the open road to visit San Rafael. 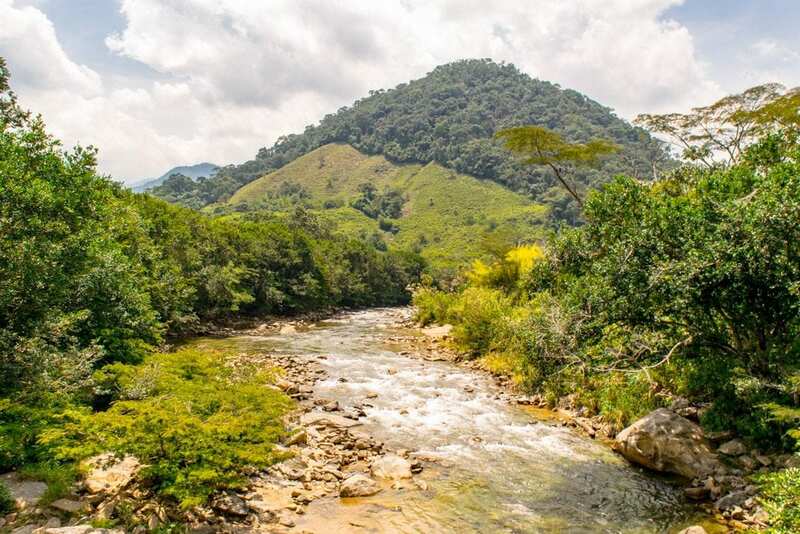 The area surrounding Guatape is made up of beautiful countryside with more than enough mountain and river views to leave your jaw permanently dropping open as you go by. Jeremy and I rented a motorbike from Colombia Getaway for the day and set off, unsure of where we would end up or what we would find. We ended up seeing the cute town of San Rafael and stopped to rest at a gorgeous river… but what we most remember about that day were the random views of the Andes mountains that we found along the way, and pulling over and photographing them whenever we got the chance. We don’t often use our own transportation on the road, preferring to use public transport and avoid renting cars when we can–so the sheer freedom of a motorbike and some epic views on a beautiful day in the countryside was incredibly invigorating to us. Visit one of Pablo Escobar’s mansions. … And play paintball in it. I’ll admit, I’m a little hesitant to include this as I feel a bit strange about the idea of playing with toy guns in the former property of a man who famously used very real guns to destroy the lives of a lot of very real people–but it is one of the most popular things to do in Guatape. The mansion, La Manuela, was named for Escobar’s daughter and was famously bombed by a vigilante group in 1993. Today, the mansion is in ruins, with nature starting to take back over, making it a very interesting place to play paintball on many levels. Take a break from Colombian food. It’s inevitable: after several weeks of any given cuisine, you’re going to start craving something radically different. In Latin America, that often means that we get a hankering for flavors from various Asian cuisines! 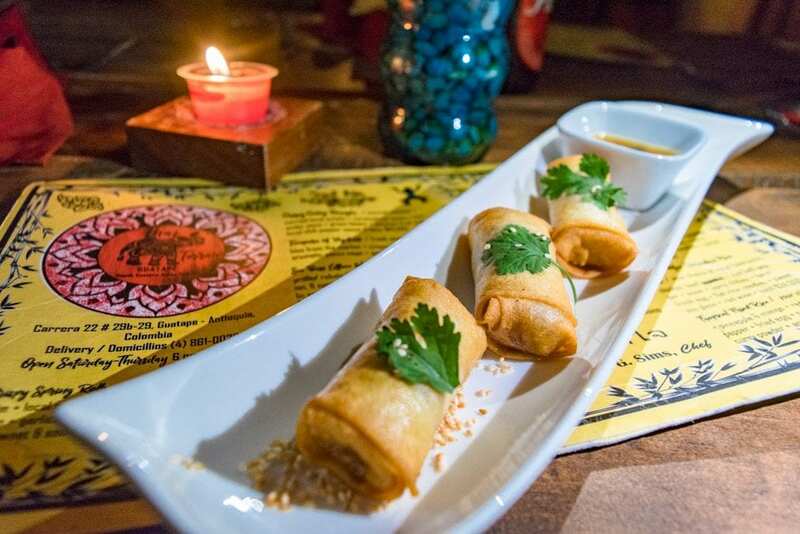 Luckily, Guatape is (somewhat unexpectedly) home to a Thai restaurant–and unlike our disastrous encounter with something billed as Thai food in Nicaragua, Thai Terrace produces some tasty Thai food! Our pad thai, red thai curry, and spring rolls were a delicious change of pace for our pallets while staying in Guatape–and the fact that the restaurant was located where we were staying in Lake View Hostel was an added bonus. What’s a lake town without plenty of things to do on the lake itself? Whether you want to try out jet skiing, head out on a kayak, jump on a tour boat or even rent a boat to take out on the lake yourself, Guatape has plenty of options to make sure you take full advantage of Guatape Lake. Our stay at Lake View Hostel was exactly what we were looking for in a place to stay in Guatape: our private room was clean and quiet (with a view of the lake to boot! ), and having both the Thai Terrace and a delicious breakfast on site was a major win (try the breakfast burrito in the morning–you won’t regret it). The hostel itself was lots of fun: there were plenty of communal spaces for hanging out, relaxing, or just enjoying the view, and having the Dragon Bar onsite to grab a drink after dinner was convenient as well (and since the bar shut down around 11, it was a win/win in our opinion–a bar with no late-night noise to contend with!). 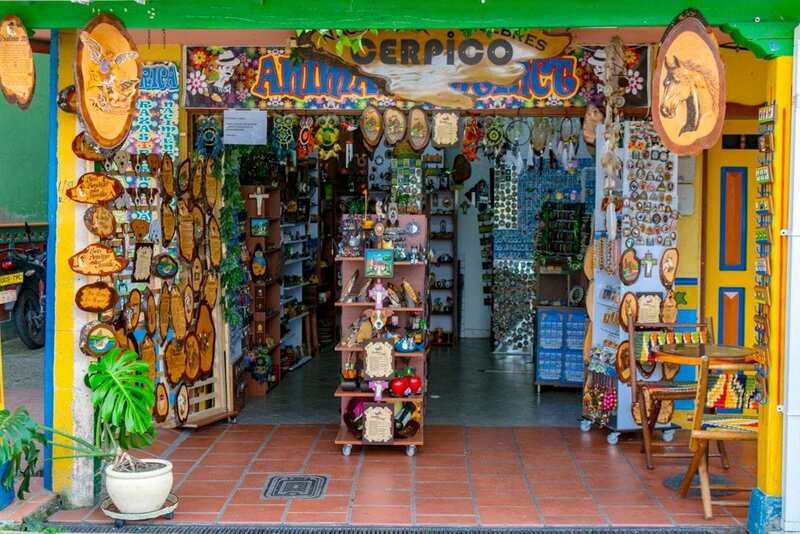 We loved being just a short walk away from both the center of Guatape with all of its vibrant colors and also the lakefront, and would not hesitate to stay again! The only downside we would note is the slow wifi connection: you’ll be fine to check social media, but don’t plan on doing any intensive internet-based work while here. Check availability and book your stay at Lake View Hostel! Most travelers visit Guatape as a day trip from Medellin, and if that’s all your schedule allows for, you can book a day trip while in Medellin. If you’re the type who likes to plan ahead, you can also book day trips to Guatape from Medellin here–but you will pay a bit of an increased price as opposed to booking on the ground. However, we really recommend spending at least one night in Guatape if possible: Guatape is worth the extra time. 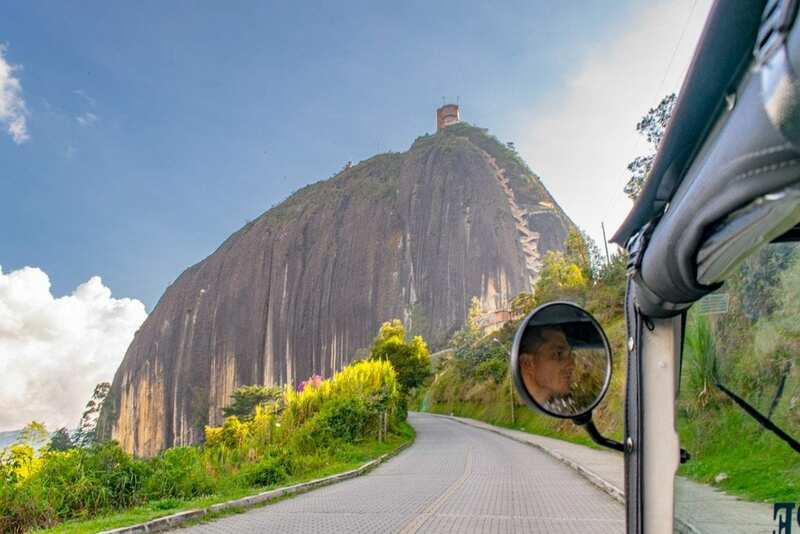 If you don’t come with an organized tour, you can easily get to Guatape from Medellin via bus: buses leave roughly every hour from Medellin’s North Bus Terminal, and the trip to Guatape takes about two hours. If you’re visiting Guatape at the end of your trip to Colombia like we were, note that Guatape is about the same distance from Medellin’s airport as Medellin itself is–so don’t worry about getting back to Medellin before going home! We headed to the airport directly from Guatape via transport booked with Colombia Getaway, which saved us the trip back to Medellin that we originally thought we would have to make. 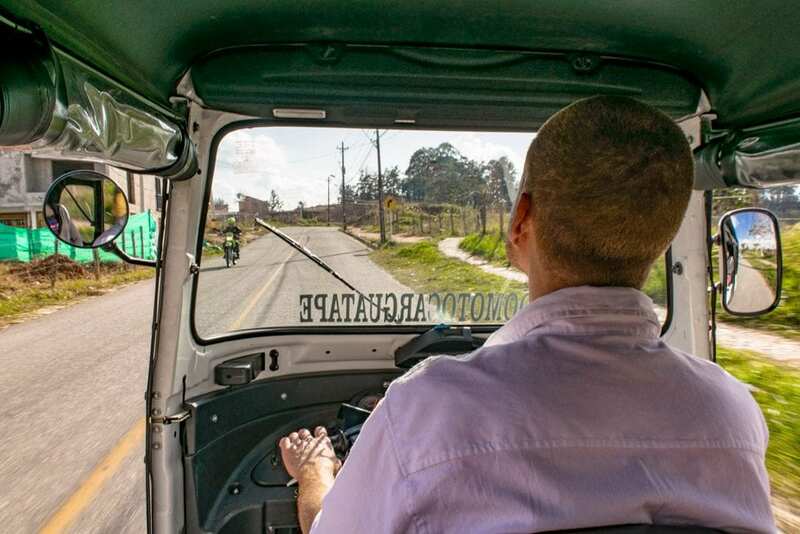 Within Guatape itself, most spots are walkable, but you’ll want to pick up a tuk-tuk to take you to the entrance to El Penol–the tuk-tuks gather right on the lakeshore and are easy to find. Don’t forget to buy travel insurance before heading to Colombia! We use & recommend World Nomads for their affordability, ease of purchasing & the clarity of their contract! — I’m sad to say that I ended up with my worst sunburn in many years while in Guatape–turns out, forgetting to reapply sunscreen while on a motorbike will do that. Don’t make my mistake: be careful with sunscreen! Bathing Suit — Feel like hiking in a river to a waterfall, rappelling down one, or simply swimming in the lake? You’ll want a bathing suit! — The water in Guatape is not safe to drink, but like everywhere else we go with unsafe tap water, we used our Steripen to keep an ample supply of drinkable water on hand while being friendly to both our wallets and the Earth. — Less for Guatape itself than for the bus ride to and from–but if you get motion sickness, you’ll want to have these on hand. Many thanks to Lake View Hostel & Colombia Getaways for hosting us for two nights in a private room, providing a dinner at the Thai Terrace and a breakfast to us, and providing us with a motorbike rental! All other costs were incurred by us and all opinions are, as always, our own. Wow, you weren’t kidding when you said Guatape is colourful! The colours in that second photo are stunning. And seriously, that breakfast burrito looks incredible. I know, right? I was overwhelmed by just how colorful it was. Aw, thanks, Aditi! Hope you get to plan a trip to Colombia soon. I’ve never been to Kerala, but would sure love to visit based on that description! Guatape looks and sounds amazing, I am definitely adding this place to my list. I just love those colourful building and I would have so much fun exploring them and taking pictures. 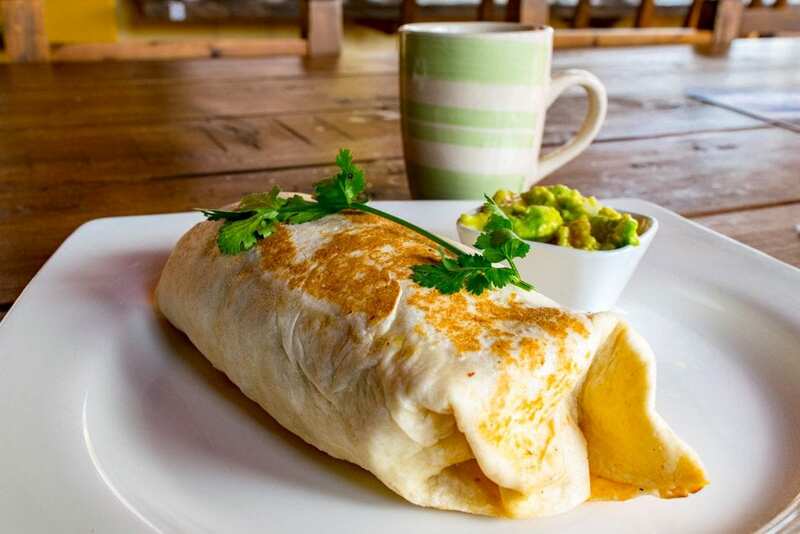 That breakfast burrito at Lake View Hostel would definitely start me on the right foot for the day. My mouth is watering thinking about it. Right? Lol we were so excited to see the burrito on the menu after a month of not having any access to tortillas! Guatape is so colorful, vibrant and lively place. 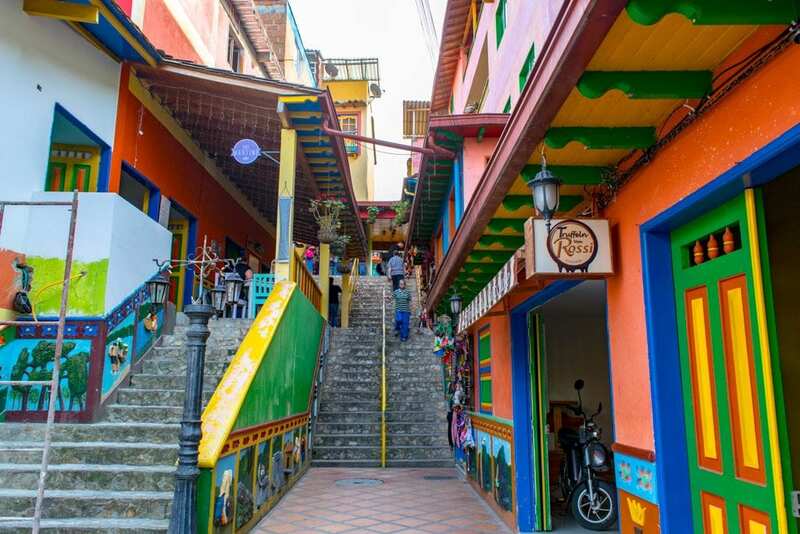 I loved the brightly colorful houses, streets and steps. As Lake View Hostel has a great view, it seems to be a nice option for staying. I love Thai food and it is good that Guatape has Thai options too. I would definitely check Thai Terrace in Guatape after reading your views. Agreed, having the Thai food option is great–especially because after a few weeks in one region, we inevitably start craving flavors from other regions. You definitely sold the idea of visiting Guatape to me! Pardon my ignorance but I didn’t even know this city existed in Colombia. But I loved it already because it has many of the things that you can love about South American cities. So colorful, cultural, with great food and lots of great locals! No worries–I had never heard of it either until we started planning our Colombia trip! I love discovering all these new-to-us spots in the world through our travels. I’ve never even heard of Guatape. I would love to go there and climb the mountain. And I absolutely adore the colors of the buildings. I agree that playing paintball in Pablo Escobar’s mansion is weird, but now that I’ve heard about it, I want to try it. Ha, right? Weird but intriguing was totally my reaction lol. Guatape is one vibrant city. I loved the way you have planed the day. I would like to spend a couple of days there. Honestly I am more of a country girl who loves to explore offbeat places. Climb El Penol is the top priory for the breathtaking view. Riding a bike and wandering around is such a great way to explore places. The food is another highlight for me there. Its quite an informative post. Thanks, Parnashree! We can never pick a favorite type of destination, but natural spots with outdoor adventure opportunities definitely always make the list! Thanks,Gyorgy! Hope you have a great time–we had a wonderful time in Guatape, it’s a very fun place to relax!